Used in 46% of Highways England Agency Areas, AbLoads protects bridges, structures and drainage assets valued at £65 billion. More than 735,000 abnormal load notifications moving along the UK's roads are processed each year using AbLoads. Remove responsibility for staff, enjoy fixed budgetary costing, significantly reduce your operational costs while protecting your structures. Cascade processes 120,000 notifications each year on behalf of MACs, ASCs, DBFOs and local authorities. 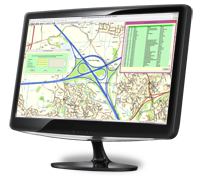 The easiest & fastest abnormal load notification software available. Submit an abnormal load notification to all the correct structure owners and police forces in less than a minute or let us produce and submit the notification on your behalf. Simple. Abnormal loads management is our core business and we love what we do. Cascade is a specialist software & services provider with a proven track record spanning 25 years and develops software principally in the fields of civil and structural engineering, with particular emphasis in the field of abnormal load management and notification. AbHaulier produces a standard notification that is sent to all authorities that do not use ESDAL (see example). For Greater Manchester and Merseyside Police, AbHaulier is able to automatically transmit your notification data to their ESDAL accounts via the new Highways England Template PDF form (see example), YOU DO NOT NEED TO USE ESDAL TO NOTIFY THESE TWO AUTHORITIES. AbHaulier LT is completely free to use, no catch. Simply download and run through the fast installation wizard and start notifying. Download now or see more information. How to manage and check Abnormal Load Notifications. Read the White Paper by John Waterfall MA FICE MHIT, Chairman, Cascade Software Limited. Abnormal loads management is our core business, Cascade is a specialist software & services provider with a proven track record spanning 25 years. "AbHaulier makes the notifiation process so simple. We are compliant without spending all our time and effort on notification paperwork." If you have any questions about our products or services or you want to just say hi, please do not hesitate to contact us.